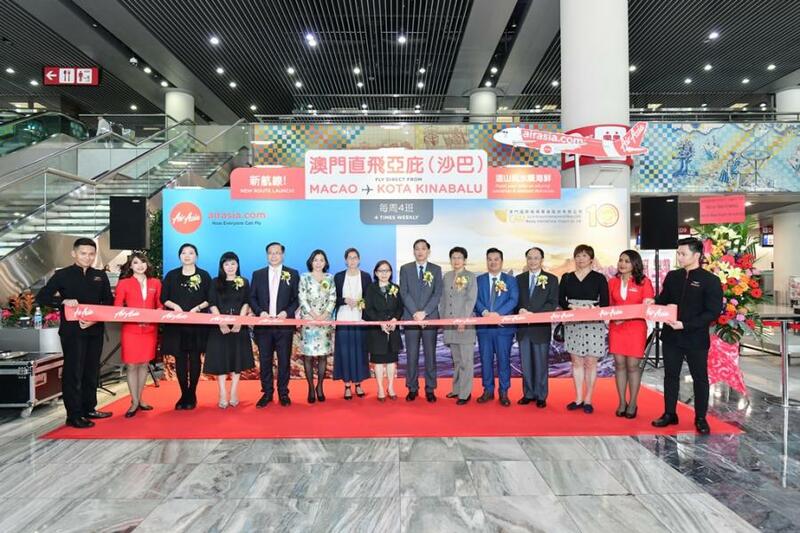 The first Malaysia (Kota Kinablu) - Macau flight of “Air Asia” held an inaugural flight ceremony at Macau International Airport (MIA) on 5th November 2018, The new Macau to Malaysia (Kota Kinabalu) route that provides 4 weekly direct flights service on every Monday, Wednesday, Friday and Sunday will mark the airline’s second Malaysian route and seventh international destinations from Macau. Mr. Eric Fong, Director of Marketing Department of Macau International Airport Company Limited (CAM) extended a warm welcome to “Air Asia” operating flight services in MIA. Mr. Fong expressed that Southeast Asia is an important source market of Macau with the growth of air passenger to travel. According to statistics, passengers of the Southeast Asia Market posted a year-on-year growth of 11% in the first three quarters of 2018. MIA is always looking for opportunity in providing better connectivity to the World, and believe this new route is set to be another popular destination for the travelers from Macau and Pearl River Delta region, at the same time, it enhances the bilateral economy growth and helps to promote tourism industry. MIA, as always, strives to incorporate with the objectives of the government’s policy to build Macau as a “World Tourism and Leisure Center”, with Air Asia commence services between Macau and Malaysia (Kota Kinablu), it marked a further step in expanding air transportation between both regions, and along with the expedite growth of travelers, it enhanced closer co-operation between the two places. To cooperate with the opening of the Hong Kong-Zhuhai-Macau Bridge, MIA will continue working with airlines, to explore opportunities and strengthen co-operation, and further expand Macau air service networks, at the same time to increase the convenience of the travellers.